Police have been getting tough on protests over the location of US bases. Is it part of a broader crackdown? I recently covered the accelerated construction of six new US heliports in the village of Takae and a new fence on Henoko beach on Okinawa. All of this is happening despite the apparently more conciliatory tone on base issues in Japan’s southernmost prefecture that was struck last month by US Defence Secretary Robert Gates. As in the past, the sudden change in tactics appears to have been accompanied by heavy-handed police action. Protestors on Okinawa have already complained of police harassment. And this week, there comes news that two middle-aged activists were arrested about 100 metres from the US Embassy in Tokyo as they tried to approach it with a letter of protest. According to other activists, when they asked the police the grounds for the arrests, they were told that the reason ‘would be given later.’ Witnesses say the march was largely uneventful until the two men were grabbed from the front of the protest group, dragged away to a police van and detained in Akasaka Police Station, without access to lawyers. The police have refused to comment on the case. That means there’s no chance to ask if these men were a genuine danger to the cops or the embassy and its staff, or whether this might not be a very old and often successful strategy: nip a potentially troublesome movement in the bud by intimidating it with a couple of more or less random arrests. A similar approach was used during Japan’s controversial Self-Defence Force ‘humanitarian mission’—since discredited—in Iraq. The protestors had already been told to keep banners and placards concealed before running into a phalanx of cops near the embassy. Six people were then reportedly allowed to approach the embassy to hand in the protest letter, which had been prearranged, but it was rejected. And when about 50 people went to Akasaka Police Station to protest the arrest of the two men, they were ‘kettled’ into a small park for nearly three hours. 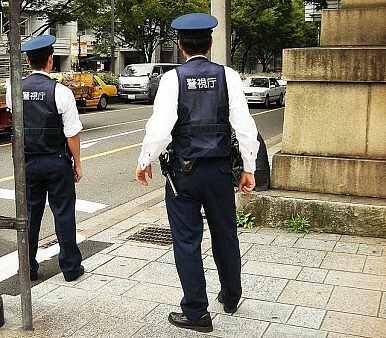 Japanese police seldom seem as enthusiastic about cracking down on right-wing violence. Zainichi (foreign) Korean activist Daniel Choi, for example, was manhandled and beaten by a group of ultranationalists in Shibuya in December as he stood with a sign protesting moves to withdraw public funding from ethic Korean schools in Japan. Police stood by, and then arrested Choi, allowing his assaulters to amble on. Choi, of course, was causing 'real trouble,' that deserved punishment (presumably unlike the ultranationalists who have for years been shouting racist abuse at Korean schools, businesses and consular offices). On paper, the right to legitimate peaceful protest is respected here. In reality, protests are only barely tolerated as long as they don’t seriously attempt to bother the status quo. But the reaction of the police, their extraordinary powers of detention and the lack of legal representation for arrestees raises the stakes very high for anyone daring to do anything but watch events unfold on TV. The two embassy protestors are being held, without charge, until March 3. Opponents of the Okinawan construction, including many veteran protestors who have peacefully marched for years, say that the atmosphere on demonstrations has subtly changed in recent weeks. Some believe that the police have been told to get tough, and may even be acting under the orders of the US Embassy. That seems unlikely, though, particularly since the Japanese authorities have proved themselves more than capable of baring their teeth all on their own when the occasion calls for it. Renewed construction in Okinawa has reignited debate over the US military. But is the time for talk over?